Potatoes were introduced to North America in the 18th century via Irish immigrants, however their native home is South America. Potatoes were first cultivated in the Andes Mountains over 7,000 years ago. 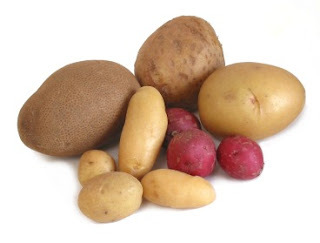 Many kinds of potatoes are seen in restaurants, grocery stores, and even homes today, but the most common of these are the russet, round white, and the red potato. Potatoes are tough and durable, store well, and have an impressive nutritional content including being a rich source of fiber, potassium and vitamin C. Like other fruits and vegetables, potatoes are a low calorie food and are free of fat, cholesterol, and sodium. Keep in mind, however, that the leaves and stems of a potato plant are poisonous and may cause illness when ingested. very good source of vitamin C, a good source of vitamin B6, copper, potassium, manganese, and dietary fiber. Potatoes should be thoroughly washed with clean tap water and scrubbed lightly before preparation. Any sprouts or eyes growing from the potato should be cut out. The skin can be removed or left on depending on use. Common methods of preparation include boiling, baking, microwaving, mashing, frying and grilling. 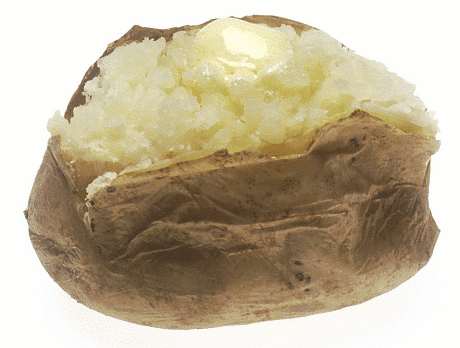 Consuming baked and grilled potatoes with the skin left on provides the most nutrients. Scrub potatoes. Make shallow slits around the middle as if you were cutting the potatoes in half lengthwise. Bake until done, 30 to 60 minutes, depending on size. Peel broccoli stems. Steam whole stalks just until tender and chop finely. Carefully slice the potatoes in half and scoop the insides into a bowl with the broccoli. Add the milk, 3/4 cup cheese and pepper. Mash together until the mixture is pale green with dark green flecks. Heap into the potato jackets and sprinkle with remaining cheese. Return in oven to heat through (about 15 minutes). Oven: 350°F. Time: 30 to 60 minutes; 15 minutes to melt cheese or to reheat. Nutritional analysis per serving (1 potato): Calories 346, Protein 24g, Fat 7g, Calories From Fat 17%, Cholesterol 20mg, Carbohydrates 44g, Fiber 14g, Sodium 327mg.